Best Worm Composter, Put Those Wigglers to Work! A worm composter is a composting bin designed to house hundreds to thousands of worms who help break down organic materials into nutrient-rich compost. Out of all of the available devices on the market, the best worm composter is the Squirm Firm Worm Factory 360. Unlike a lot of worm composting bins, the Worm Factory 360 includes a lot of the materials a user needs to set up their own composting production. Some of these items include a thermometer, infographic on what the worms can eat, and a step by step instruction manual. The Worm Factory 360 is made of recycled plastic, making it even more environmentally friendly than other options. Finally, it is tall, lightweight, and fully adjustable so an individual can add or remove trays to increase or decrease the bin’s size. This means it fits in almost every apartment. The Worm Farm 360 is a great option for worm composting. See our Product Reviews section for a complete review of this product. Our Runner-Up composter is the HotFrog Living Worm Composter. This worm composter has many of the same features as the worm Factory 360 but is more expensive and less adjustable. It has a double-layered lid as well as built-in moisture control and a water retention channel to prevent the material inside of the bin from drying out. It features two large trays and a collection bin for worm tea while also being odorless. See our product reviews section below for more information on the HotFrot. For those on a budget, be sure to check out the Quest 4-Tray Worm Factory. This small bin has no-frills and sticks to the basics. It has four separate trays where the worms can dig their way up through the compost, leaving behind trays of usable materials. There is a spigot near the bottom used to drain the composter of worm tea or liquid fertilizer. The entire composter costs as low as $50 and is odorless and easy to use. For more information on the Quest 4-Tray composter, see below. All of the worm compost bins are powered by worms. Obviously! The worms process the compost in the bin, and they drop their castings, which is a nutrient rich compost material. They also expel the worm tea, which is a superpower fertilizer. Some compost bins come with worms, but most do not. 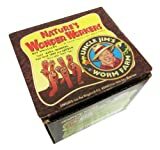 If you need worms, be sure to pick up some Uncle Jim’s Worm Farm Red Wigglers. This box contains 500 red wigglers. Most of the composters on this list are going to need 500 to 1,000 worms to get started. Most of the composters on our list need bedding as well. This bedding should be dark, rich compost, free of vermiculite or perlite (i.e. not potting soil). Dr. Earth Natural Compost is a good choice. 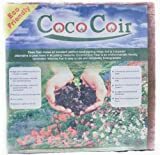 Alternately, you could use coconut coir like this Coco Coir from Amazon as worm bedding, as it tends to work quite well. See your specific worm farm for a recommendation as to what will work best. Below are more in-depth reviews on some of the worm composters on the market, including the champion: Squirm Firm Worm Factory 360. First on the list is one which didn’t make the top 3, but is still a quality product: the Hungry Bin Flow-Through Worm Farm. The Hungry Bin Flow Through Worm Farm is a green box that looks very much like a recycle bin, and in a way, it is! Worms living inside process your food scraps, and out comes great compost, and compost tea as well! It’s the only bin on our list that doesn’t have multiple tiers, so it has a different functionality than other designs. Product dimensions: 24 x 26 x 37 in. The Hungry Bin Flow-Through Worm Farm is different from many other models on the market because it consists of one large bin with an attached worm tea tray. It is easy to manage and can be filled with compost without needing to worry about layers. The bin is simple to clean and can be moved around on wheels. The Hungry Bin actually looks a lot like the plastic garbage cans seen in public places. This worm composter is expensive but holds quadruple the amount of worms and compost compared to some of the other composters on our list. The design is highly efficient, so moisture and liquids gather at the bottom to be collected (in a separate manner from compost collection). The Hungry Bin uses insulated plastic and is sturdy and heavy to protect the worms inside. Hungry Bin made this helpful chart to cover how to use the Worm Farm, including how to get the composting process started, and how to keep the interior environment in the best shape possible for speedy composting. The Hungry Bin worm composter is simplistic yet effective, although the price will make people wary of spending so much money without any additional features compared to some of the other bins on our list. It holds a large number of worms, unlike the other models, but requires a more significant investment which people might not be willing to make. It also doesn’t come with all of the useful materials as seen in the Squirm Firm’s worm composter. 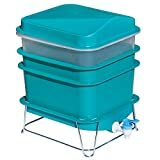 The Quest 4 Tray Worm Composter is one of the smaller composters on our list and features a cute turquoise plastic design that takes a welcome step away from the generic green and black plastic that is so common among composters. This composter is attractively priced and is our budget pick among worm composters. Dimensions: 9 x 12 x 8.5 in. The Quest 4-Tray Worm Factory Farm is a small worm composter positioned at an outstanding price point. It’s pretty attractive for those who are just getting into composting, and who want to try it out to see if it’s for them. The bin is extremely small and can hold fewer than 500 worms. The 4 trays connect to one another with holes between each layer so the worms can move freely on the inside. It comes with a worm tea tray and a spigot to easily dispense the fertilizer for use. The Quest offers few additional features and does not come with worms, so be sure to stock up when you purchase. The Quest 4-Tray is great for individuals who want to try composting before moving to a bigger bin and is a minimalist version of other products. Unfortunately, this minimalism means that the material is pretty cheap and that not a lot of composting can be done in the small container. Compared to the other, larger options, it works best for newcomers to composting or those on a stringent budget. The Worm Factory 360 is one of our favorite worm composting bins, as you can see by looking at our complete review of the Worm Factory 360 bin here. It’s a great system that is pretty flexible and modular and is quite well thought out. It also includes a lot of extras, including starter worms, which is a good thing! Product dimensions: 18 x 18 x 15.5 in. The Worm Factory 360 is tall and slender so it takes up less room indoors than some of the other models on the market. It comes in black, green, or terracotta and is adjustable so owners can add more trays as needed. It is lightweight and made from recycled plastic to be environmentally friendly. The plastic is sturdy and makes for solid construction. This compost bin is easy to maintain: so long as the worms are fed the proper materials, it requires little to no cleaning. Owners do need to empty the worm tea monthly or once every two months to prevent an overflow. The manufacturers recommend that the worm tea container be cleaned with warm water and dish soap after it is emptied. The Squirm Firm’s Worm Factory 360 is easy to set up. Users need to ensure the trays fit together with roughly 5 in. of space between the bottoms of the trays. This space can be filled with dirt, newspapers, cardboard, and other compostable materials. The bin is fully functional and simple to use and maintain. This bin comes with a lot of accessories which are useful for novice and professional composters. Some of them are a thermometer, an infographic about what worms can eat, an instruction manual, and a worm starter kit. These ensure that the user keeps the internal environment of the bin safe and healthy for the worms who will be doing the composting. The Squirm Firm beats the competition because it balances being large and detailed with being affordable. Unlike a lot of the other composters, this bin includes numerous supplemental materials, easy access to the manufactured worm tea, and the ability to add more trays as needed to expand the bin’s size. For all of these reasons, it comes out on top. Built in "worm tea" collector tray and spigot for easy draining. The Hot Frog Living Composter is by far the most attractive worm composter on our list, and is a compelling offering. The green plastic box with attached wooden legs is much more reminiscent of an Ikea product than, well, any other composter anywhere! Product dimensions: 15 x 15 x 22 in. The FCMP Outdoor composter is also called the Hot Frog because of its signature color. It features three different layers where worms can dig through fresh and old materials to create compost. The whole design is sleek and compact with polished wooden legs. Each of the top two layers has 40 holes in the bottom so worms can move between the sections. When used properly, the FCMP Outdoor worm composter is odorless and removes excess moisture from the compost. Users need to manually remove any worm tea produced during the process. Unlike a lot of composters, this one has extra insulation to protect the worms from temperature changes indoors and outdoors. The full composter arrives already set up but is difficult to take apart to clean. There is a valve on the bottom, but sometimes worms get stuck there and can’t be removed. The FCMP Outdoor Living Composter is one of the best choices aesthetically, which makes it our runner-up pick. However, there are some usability concerns that are a bit of a concern. The HotFrog lacks the ease of use seen in other models. It holds a decent number of worms, but the price tag is a bit high. It’s also a bit difficult to clean and users might have trouble accessing the worm tea. Further, it could be considered a bit of a worm hazard since they frequently get stuck in the valve or in some of the holes. However, it is simple and sturdy. The VermiHut 5 Tray Worm Compost Bin is one of the larger worm composters on the market, and it is a pretty solid design. Five trays are included, but up to seven can be stacked, making this compost bin a great choice for those who want a small-footprint compost bin that has significant capacity. Typically when you fill a tray on the Vermihut, the bedding and compost materials really squish together. This is good, and it allows the worms to travel from tray to tray. You may want to remove each tray about once per week and turn the compost, to loosen everything and create new pathways. The lowest tray has a spigot attached and is designed to catch the worm tea produced during the composting process. However, usually at least a little bit of the castings get in there, but it is mostly tea. The spigot tray has a slight slant to it to allow the liquid to drain out, which it typically does pretty well. If the worms get through the nylon mesh, they can muck up the process, and it will require placing the worms back up on an upper tray. The Vermihut works in temperatures up to the low to mid-80s, but if the temperature is going to be higher than that, your worms may die. It gets really quite hot inside the trays, so be careful to watch the temperature. Try to keep them in a garage or cooler area. Typically you’ll want to start with between 500 and 1,000 worms. They will rapidly multiply, to begin with, to fill the compost bin. Once they reach a maximum carrying capacity, they will stop multiplying and you should achieve a steady state, assuming temperatures remain reasonable. Some have found that the ventilation holes on the Vermihut are a bit too big, and allow fruit flies to enter and become a big nuisance. The best way to prevent this circumstance is to put nothing but paper or fabric in the top-most tray, to act as a barrier to fruit fly invasion. However, this turns the Vermihut into a four-bin composter as opposed to a five-bin composter. As we mentioned above, you can expand the composter with additional trays, to bring the total up to seven. Overall, the Vermihut is a pretty solid composter capable of supporting a large number of worms, and capable of rapidly producing high-quality compost materials. It’s priced toward the lower end of worm compost bins, yet has a solid capacity, and a great warranty. The Vermihut is yet another excellent choice for a worm composter. People interested in composting with worms have numerous options when it comes to bins, including ones which fit just about any budget and ones that include guides on how to compost correctly. The best worm compost bins are easy to use, have a solid capacity, and manage odors and pests well. All of the composters on our list today succeed in these tasks, but the stand out is the Worm Farm 360. It’s positioned at a great price point, is expandable, comes with pretty much everything you need to get started, and is an excellent choice.